Choir member, Judith Rowley, took part in the Overgate Hospice Midnight Walk on Saturday 10 September. Judith and her family raised around £600 for the Hospice. Where and when were you brought up? My father being an Anglican priest, we moved around quite a lot when my sister and I were young in the early 50s. I remember the lifting of sugar rationing and watching the Coronation on the television [the only one in the Parish] at the house of my father’s church warden in Lambeth. I recall, too, the re-opening of the Imperial War Museum after enemy action and the re-consecration of St George’s Catholic Cathedral Southwark following its more or less total destruction in the Blitz; only the outside walls remained. But most of my childhood and teenage years were spent in Oxford – my father was Vicar of St Margaret’s Church and Chaplain of St Hugh’s College where his first organ scholar was the famous conductor Dr Jane Glover. You describe your education as being at Oxford’s Magdalen College School and the Royal College of Music in South Kensington. That’s correct. I am one of very few professional organists who was not University-educated. The time at Magdalen College School was particularly significant in respect of the huge encouragement given to me by my teachers. At the Royal College, I was privileged to study with the great Dr John Birch, legendary Cathedral Organist at Chichester and later at the Temple Church and the Royal Albert Hall. John was also Organist and Accompanist to the Royal Choral Society, working closely with Sir Malcolm Sargent and Meredith Davies. Both of those two great conductors were considerable influences upon me – and prodigally generous and kind to me. When did you first come to Halifax? Easy question! The late sixties, at the invitation of Neil Wade and Cyril Baker to give a recital at what was then Halifax Parish Church and is now Halifax Minster. I loved the organ from first acquaintance, and the building too. I remain convinced that the Halifax instrument is one of the very finest in Europe and certainly one with a most glorious sonority and musical colouring – a real gem. During the very late 60s and early 70s, I worked at the City of London, at Westminster and St Albans Cathedrals and as Director of Music at St Albans School. On moving to Yorkshire in 1975, I spent thirteen happy years in the town as Chorus Master to Halifax Choral Society until 1988 and was very happy to re-kindle music-making here in 1997 as second Conductor of Overgate Hospice Choir in succession to Founder-Conductor Donald Maxwell-Timmins. My family and I have been deeply privileged to have been the recipients of immense kindness from so many folk in Halifax. I count fellow-musicians Keith Swallow, Phillip McCann and Roger Bullivant as Halifax friends, because it was at Halifax that we first worked so happily together. Keith and I still do an August weekend of light music at Scarborough together with Phillip. There have been so many happy years with fellow Overgate workers such as Valerie Ashworth, Philip Taylor and Keith Scotford. And what magnificent accompanists we have had – among them Jonathan Lilley and Tom Moore and, of course, our great friend Alan Horsey who does so much for the Choir. 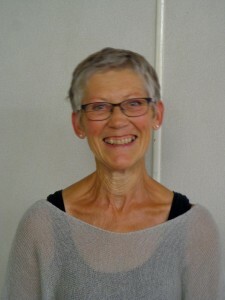 Very special thanks goes to our Treasurers and all other officers past and present as to the indefatigable Joan Dunn, our hardworking Librarian. It is good, too, to be still in touch with Colin and Margaret Mason who got me involved with Overgate and its musicians in the first place! I have been privileged to have known all the successive Vicars of Halifax between Canon Hardie and Canon Barber. What are your involvements with other Choirs? I worked at Leeds Parish Church, now Leeds Minster, since 1975 and my final service was on Saturday 3 September 2016. Since 1977, the year of the group’s founding, I have been Music Director of St Peter’s Singers based at Leeds Minster. I became Conductor of Sheffield Bach Choir in 2009 and Doncaster Choral Society a year later. Both the Sheffield and Doncaster Choirs provide opportunities to conduct concerts using professional orchestras and soloists, as, of course, does Overgate Hospice Choir. At St Peter’s Singers, we are hugely fortunate, in the main, to draw upon choir members for solo duties in concerts, many of whom have very happily undertaken such roles in Overgate enterprises. Other tasks include the accompaniment of Key Stage 2 Singing at St Peter’s CofE Primary School at the heart of inner-city Leeds. 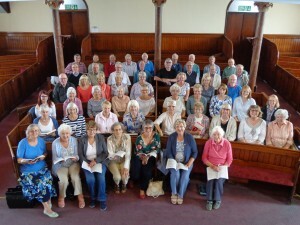 Work in many capacities for getting on for half a century for the Royal School of Church Music has included the direction of many choir courses at home and abroad. I am a life Vice-President and Trustee of Leeds Philharmonic Society and their Music Programme Manager. I was Phil Chorus Master from 1975-1983. What about your experience as an Organist? Organ accompaniment is one of my all-time favourite activities. I have played for major choirs and in world-famous orchestras in choral and orchestral spectaculars all over Britain. My work as Leeds City Organist has involved over 600 recitals on the fine organ at Leeds Town Hall. I have been privileged to give regular organ recitals at London’s Royal Festival Hall – no pressure there, then! – and to have been invited to play Elgar’s Organ Sonata at the 1975 Henry Wood Promenade Concerts; at “my” Prom, the great Sir Adrian Boult conducted Brahms’s Fourth Symphony and took my wife and family back to his flat for dinner afterwards – an extraordinary and wholly memorable occasion on one of the very hottest evenings of that very hot summer. There have been two best-selling Naxos CDs – French Organ Music from Leeds Parish Church and Handel Organ Concertos with the [now Royal] Northern Sinfonia in Newcastle. I particularly appreciated the latter commitment which came after an extended period of ill-health and during the three days of which the Orchestral management and my musical colleagues there looked after me quite wonderfully. Are you engaged in other musical work? Yes, certainly. 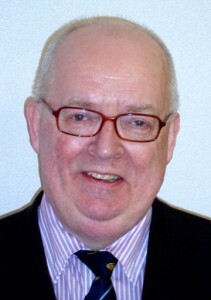 I am Trustee of the John Pilling Trust in Blackburn and a Director of the English Hymnal Company. I have served in turn as President of the Royal College of Organists and of the Incorporated Association of Organists; I am an elected member of the Royal College’s Trustee Council in my capacity as a former President and have just been nominated for a further term. I am a former President of Leeds Organists Association, and have recently been elected an Honorary Life Member; in 2013 I served as Centenary President of Sheffield and District Organists’ and Choirmasters’ Association. I am privileged to be a Freeman of the City of London and a Liveryman of the Worshipful Company of Musicians. I served for thirteen years as Chairman of the Friends of the Musicians’ Chapel at the Musicians’ Church – St Sepulchre without Newgate in the City of London, the church of the “Bells of Old Bailey” in the nursery rhyme; I was also a long-serving Churchwarden of St Sepulchre’s during the rectorship of The Reverend Dr Peter Mullen, retiring from that post in 2014. I was Organist to the United Grand Lodge of English Freemasons between 2010 and 2012 and have been in office here in the Province of Yorkshire West Riding as Provincial Grand Organist since 2010. I have twice been Master of Zetland Lodge, 1311 and am Organist to the Richard Gill Chapter of Rose Croix Masons here in Halifax at Southwood. Travel – especially rail travel, cooking, local history, writing and public speaking, keeping in touch with the children and grandchildren and walking (of which I should do much more). If you had your life over again and were prevented from following the career that you have, what do you imagine you might have been? Either a staff accompanist at the BBC, or a writer about matters musical. If it had to be nothing really to do with music, I’d rather have liked to have been an historian. Choir members spent Saturday 10 September working with tutors Helen Strange, Anita Wiencelewski, Alan Horsey and Dr Simon Lindley on Haydn’s Creation. The work is to be performed at the Choir’s Silver Anniversary concert on Saturday 8 October at 7.00 pm in All Saints’ Church , Elland. 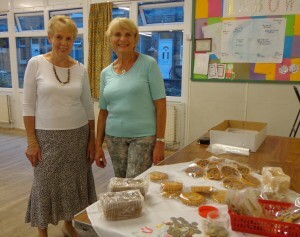 Choir member Margaret Marshall , pictured on the right, has raised £100 for our cause by selling her delicious cakes to members of the choir.